The Rio Sonicleanse makes use of a micro-pulsating high frequency sonic action to help reduce the appearance of blemishes, oily areas, blocked pores and dry skin patches. Cleansing your skin in just 60 seconds, it also provides deep down exfoliation for a revitalised feel. Gentle enough to use as part of your daily routine, the head pulses at 10,000 times a minute to loosen dirt and oil to cleanse your pores. Featuring soft bristles, the Rio Sonicleanse has adjustable power levels for varying intensity; low power levels provide gentle cleansing and higher levels offer deep penetrating sonic cleansing. 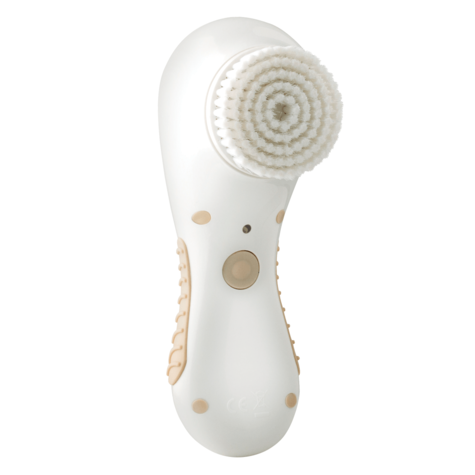 Rio Sonicleanse takes the effectiveness of daily skincare routines to the next level with micro-pulsating technology. Sonicleanse goes beyond merely rotating; it pulsates at an incredibly high frequency for a superior clean that manual cleansing is simply not able to achieve. 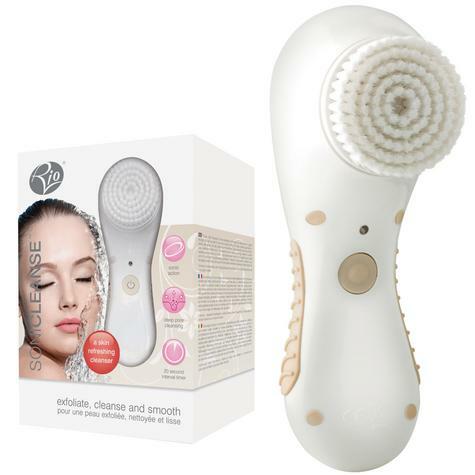 Using micro-pulsating, high frequency technology, the cleansing brush head, with over 44,000 individual bristles, pulsates at an incredible 10,000 oscillations a minute to gently loosen dirt and oil for a deeper, far more effective clean. This deep clean targets the appearance of pores, oily areas, dry skin patches and blemishes. Sonicleanse can be used daily to help remove the epidermal layer of dry and flaky skin cells and to help remove dirt and grime from deep within the pores, leaving skin feeling and looking refreshed, smoother and revitalised. 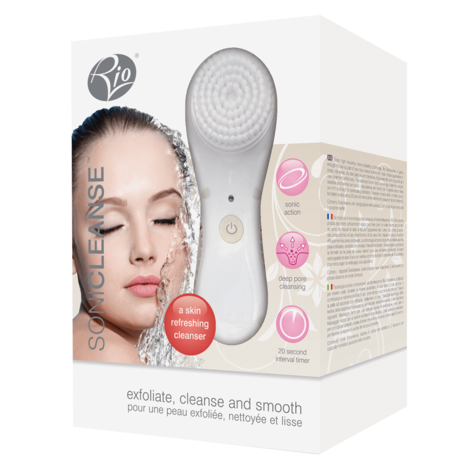 Sonicleanse is a facial cleansing device that has benefits for all skin types – including sensitive, dry, combination and oily skin. Sonicleanse is cordless and is simply charged by placing the unit into the charging cradle. The brush heads are easily attached by simply clicking into place. The face should be dampened with warm water and a preferred cleansing product applied to either the soft brush head or directly onto the skin. The choice of cleanser is purely down to personal preference. Sonicleanse offers two skin cleansing programmes – a programme that presents a lower frequency of sonic pulses for a gentle cleanse, and a programme with a high frequency action for a deep-penetrating cleanse. It is recommended to begin with the lower frequency programme before progressing to the higher frequency programme to allow the skin to adjust to the new sonic cleansing regime. The lower frequency programme is selected by pressing the main programme button twice. The light will illuminate green when the programme is selected. The higher frequency programme is selected by pressing the main programme button once. The light will illuminate red when the programme is selected. For deep-pore cleansing, the unit is simply held gently against the surface of the skin and moved in small circular motions across each treatment area of the face. Sonicleanse encompasses an in built timer which indicates with a ‘beep’ when it has been used continuously for 20 seconds. At each ‘beep’ it is suggested to move onto the next area. It is recommended to start with the forehead, and then move onto the nose, chin and finally the cheeks. Sonicleanse will automatically switch off after 1 minute so use two timed sessions to treat the whole face. After treatment, the skin can be rinsed clean using warm water and followed with skin serums or moisturisers.